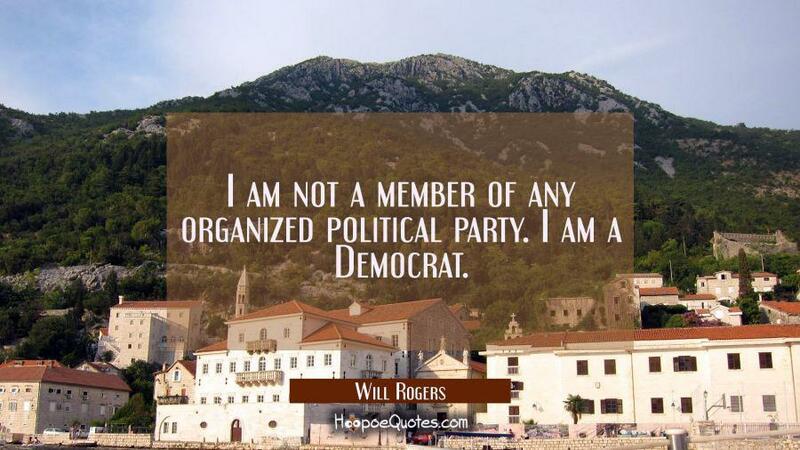 Political parties are what our political life, or the whole of our lives, really revolves around. Click on this Link to see what some of famous party members said. It can seem sometimes that individuals are the ones who make the change, but in reality it is the parties who pull all the strings, and financiers, of course. In the USA it is probably more transparent than in the rest of the world, but Americans always end up choosing between only two parties. Is it really a choice? Some families have tradition of being elected (Bush, Clinton…) or continue to have large influence on political affairs. And even if they don’t get elected, they will pull the strings anyway. When was the last time a simple common man was chosen President? Half a century ago? It is obvious that I don’t have much love for political parties. But I really enjoy watching and listening those less-skilled party members and officials when they give public statements. Who needs comedians anymore, when you get to listen to politicians all day long! I may not be a party-lover, but I adore funny political quotes. Here are some of my favorites to make you smile. It is the least you can do in a party-run world. Unfortunately, he wasn’t. Maybe it is not in human nature to think on a large scale and do something about it directly, instead of easily transferring their rights to some lousy second-class clerks and rich daddy-boys. Who knows? One can only hope that one day humanity will become conscious about itself and need to cater the needs of all humans. Until then, we are left in “good” party hands. Welcome to Funny Political Quotes! I try to collect best funny political quotes and share them with you. I hope you like them.